BORODYANKA, Ukraine -- In a country where at least 4,000 localities had a main thoroughfare named after Lenin, outlawing remnants of the Soviet era like street names and statues was bound to cause problems. 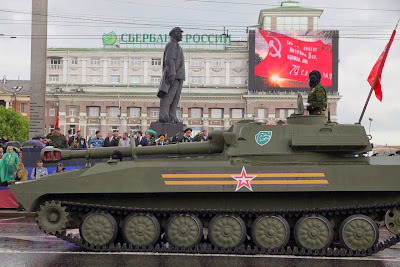 Pro-Russia separatists pass a Lenin statue during the World War II Victory Day parade May 9 in Donetsk. The tank in the photo is clearly a Russia-supplied tank. Thousands of municipalities are puzzling over how to respond to just such a mandate, which went into effect Wednesday, without sowing confusion or alienating swaths of voters. While few outside Crimea and the rebel strongholds of eastern Ukraine want to join Russia, not all Ukrainians are ready to repudiate a joint history that remains dear to many across generations. “I wanted to tell my child that there was ‘Uncle Lenin,’ and at one point Mama took part in a big celebration in Kiev” in honor of the first Soviet leader, said 37-year-old Svetlana Arshavina, who lives in this suburb northwest of the capital. “Now what will I tell her? That they took Uncle Lenin and smashed him to pieces?” she asked. That fate has met Lenin statues across the country since the pro-Western government swept into power in Kiev last year. The phenomenon is so common now that it has its own name—“Leninopad” or “Lenin-fall,” a phrase that echoes the Ukrainian word for snowfall. Borodyanka, population 13,000, was already testament to a history in flux, with a Communism Street just a few blocks down from Independence Street, marking the Soviet Union’s 1991 collapse. Tensions bubbled over when the town’s Lenin statue—already relocated to a square on the outskirts in 2008—went missing twice over the past year. The original life-size bronze was knocked over in the middle of the night last spring and damaged beyond repair. Mayor Viktor Trakhun, a former Communist Party member, reached out to local World War II veterans’ groups to help clean up the mess. Some of them “said they wanted to put it back up,” he said. So on April 22, “Lenin’s birthday, they drove up with a few television crews” and replaced it with a marble bust. By early May, though, the bust was missing. The pedestal is now covered with a green tarp. Nikolai Zakharchuk, who was responsible for resurrecting the statue, blamed vandals for tearing it down. Upon further questioning, he abruptly hung up the phone, saying he didn’t trust an American reporter. Backers of the law say it is needed to help the former Soviet republic break from Russia’s sphere of influence and move closer to the West. “Children are already reading in textbooks that Lenin is a criminal, but are walking to school along Lenin streets and walking by Lenin statues every day,” said Volodymyr Viatrovych, head of Ukraine’s Institute of National Memory, who helped write the law. Many critics, though, consider it a waste of time and money. A parliamentary survey in 2012 (before Russia’s annexation of Crimea) found Lenin was the name of the main street in at least 4,000 cities and villages across the country. That doesn’t count Lenin squares or other Soviet-linked names like Red October. The law gives the national government authority to step in and change names where locals refuse to do so. But an official close to the president said it was meant merely as an impetus for change. Rights activists say the law also faces potential court challenges. For example, it calls for up to five years in prison for individuals “creating, spreading, or publicly using” communist or Nazi symbols, which could violate freedom of speech laws. 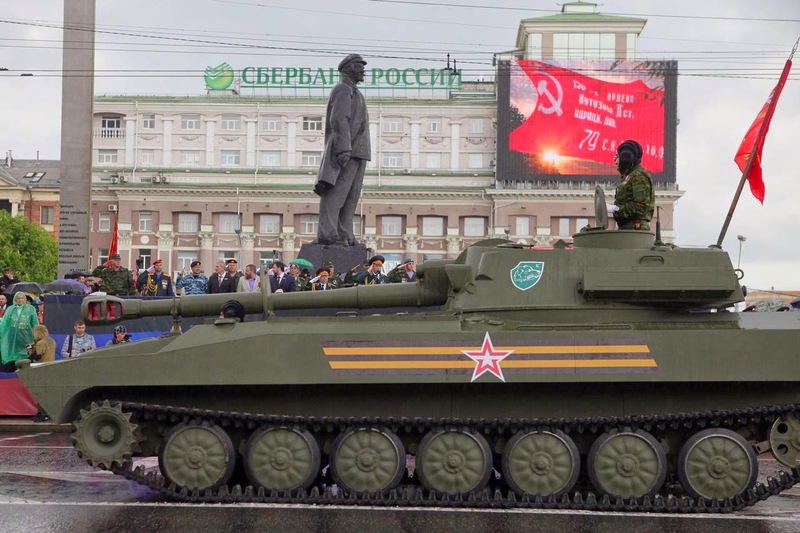 In Kiev, the city has vowed to take down all Communist symbols from government buildings, streets and subway stations by August. But no one yet knows what to do with the 335-foot-tall Soviet-era “Motherland” statue that towers over the city. Part of a World War II museum, it depicts a giant warrior woman with a shield bearing the Soviet hammer and sickle. In Borodyanka, the town council said it would have to change 17 street names. Mr. Trakhun said he had already been approached by people concerned that they would have to change passports and other documents to update the address, though the government has said nobody would be forced to do so immediately. “This isn’t the most important thing in our country right now. It’s populism,” said Marina Kovalenko, a 35-year-old Borodyanka resident.